Neymar da Silva Santos JÃºnior commonly known as Neymar or Neymar Jr., is a Brazilian footballer who plays for FC Barcelona in Spain and the Brazilian national team as a forward or winger.At the age of 19, Neymar won the 2011South American Footballer of the Year award, after coming third in 2010. He followed this up by winning it again in 2012. In 2011 Neymar received nominations for the FIFA Ballon d'Or, where he came 10th, and the FIFA PuskÃ¡s Award for Goal of the Year, which he won.He is known for his acceleration, speed, dribbling, finishing and ability with both feet. His playing style has earned him critical acclaim, with fans, media and former players drawing comparison to former Brazil forward PelÃ©, who has called Neymar "an excellent player", while Ronaldinho has stated "he will be the best in the world".Neymar joined Santos in 2003 and, after rising through the ranks, was promoted to their first team squad. He made his debut for Santos in 2009 and was voted the Best Young Player of the 2009 Campeonato Paulista. Further awards followed, with Neymar being voted best player as Santos won the 2010 Campeonato Paulista, and also being top scorer in the 2010 Copa do Brasil with 11 goals. He finished the 2010 season with 42 goals in 60 games, as his club achieved the Double. Neymar was again voted best player of the year in 2011 as Santos retained the state title and also won the 2011 Copa Libertadores in which Neymar scored six goals in 13 appearances. He also played a key role in securing a Continental Double, Santos' first since 1963. Neymar received the Bronze Ball in the 2011 FIFA Club World Cup, with Santos reaching the final, where they were defeated 4–0 by Barcelona. 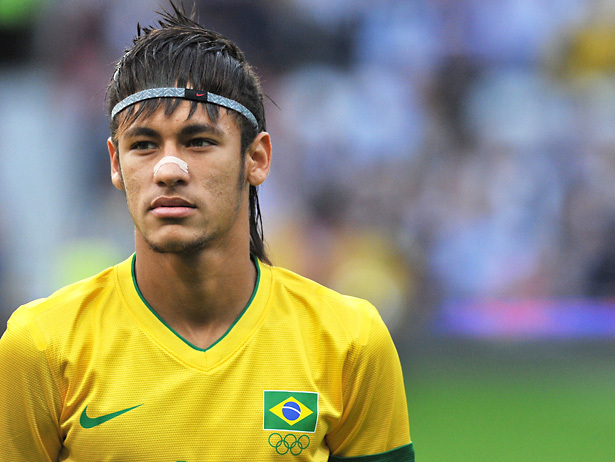 Neymar has represented Brazil at Under-17, Under-20 and senior levels. On 10 August 2010, at the age of 18, he made his debut for the SeleÃ§Ã£o in a friendly match against the United States; he scored from a header in the 28th minute, contributing to Brazil's 2–0 win. Neymar was the top scorer of the 2011 South American Youth Championship with nine goals, including two in the final, in the 6–0 win against Uruguay, helping Brazil to win their eleventh title in the competition. Neymar was selected as part of Luiz Felipe Scolari's Brazil squad for the 2013 Confederations Cup on home soil. For the tournament he was assigned the iconic number 10shirt. On 30 June, Neymar scored Brazil's second goal in the 3–0 final win over Spain. 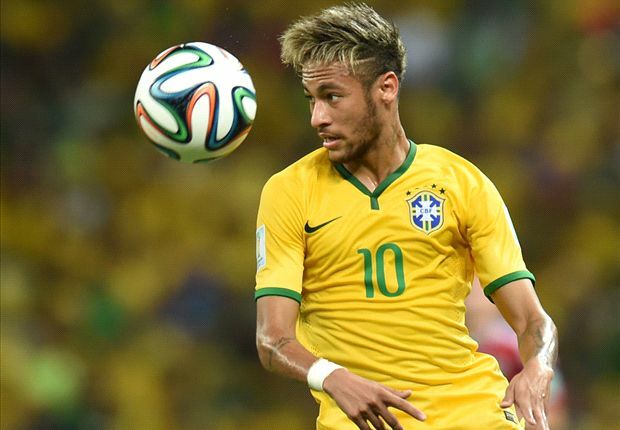 Neymar's performances saw him awarded the golden ball for the best player of the tournament. At the 2014 FIFA World Cup, Neymar scored four goals before he fractured a vertebra in his spine in the quarter-finals and missed the rest of the tournament. He received the Bronze Boot as the tournament's third top goalscorer, and was named in the World Cup All Star XI. With 35 goals in 52 matches for Brazil, he is the sixth highest goalscorer for his national team. In 2012 and 2013, SportsPro named him the most marketable athlete in the world. 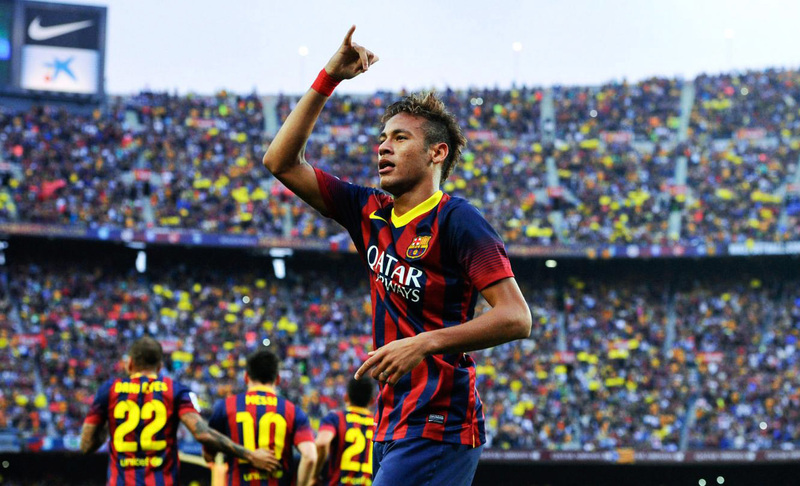 In December 2013, Neymar was ranked by The Guardian as the sixth best player in the world. Last edited by reality; 08-04-2014 at 07:58 PM. Being a top footballer at such a young age, Neymar has already won a host of awards. Below are the achievements that he attained during his career. Last edited by reality; 08-01-2014 at 05:04 PM. Last edited by reality; 07-31-2014 at 11:45 PM. മാഡ്രിഡ്: ലോകകപ്പിനിടെ നട്ടെല്ലിന് പരിക്കേറ്റ് പുറത്തായ ബ്രസീല്* സൂപ്പര്*താരം നെയ്മര്* സ്പാനിഷ് ക്ലൂബ്ബ് ബാഴ്*സലോണയ്ക്കുവേണ്ടി വീണ്ടും കളത്തിലിറങ്ങാനൊരുങ്ങുന്നു. ആഗസ്ത് 18-ന് നടക്കുന്ന ക്ലബ്ബിന്റെ സൗഹൃദമത്സരത്തിലാണ് ബ്രസീല്* സ്*ട്രൈക്കറുടെ തിരിച്ചുവരവ്. മെക്*സിക്കന്*ക്ലബ്ബ് ലിയോണുമായാണ് നൗകാമ്പില്* ബാഴ്*സലോണയുടെ സൗഹൃദമത്സരം. ഒരാഴ്ചയ്ക്കുശേഷം ആരംഭിക്കുന്ന ലാലിഗ പോരാട്ടത്തില്* എല്*ച്ചെയുമായാണ് ബാഴ്*സയുടെ ആദ്യമത്സരം. 'എന്റെ പരിക്ക് കുറേശ്ശെ ഭേദമായിവരുന്നു. 100 ശതമാനവും ഭേദമാവുന്നതോടെ ഞാന്* ബാഴ്*സയിലെത്തും'-ജപ്പാനില്* നടന്ന ചടങ്ങിനിടെ നെയ്മര്* പറഞ്ഞു. ആഗസ്ത് അഞ്ചിന് താരം ബാഴ്*സലോണയില്* തിരിച്ചെത്തുമെന്നാണ് പ്രതീക്ഷിക്കുന്നത്. ലോകകപ്പ് ക്വാര്*ട്ടറില്* മെക്*സിക്കോയുടെ യുവാന്* സുനിഗയുടെ ഫൗളിനിടെയാണ് നെയ്മറുടെ നട്ടെല്ലിന് പരിക്കേറ്റത്. Neymar would shine more in the middle citing the example of the legendary Pele. "We have to find a solution. Football is very versatile today and you need a lot of movement," he is quoted as saying by Sport. "Having a fixed No.9 can do well in some tournaments, but not in others. You have to be mobile and create space. We have difficulties with some players because they leave when they are 17 or 18 and don't play for their teams. "Then they have no experiences or self-esteem and the national team suffers. "If we all believe that Neymar is our best player, he should play in that position and others should adapt to him. "If we didn't play Pele in that position, Pele wouldn't have played well. Pele has to play in Pele's position and the others should adapt." sherikkum ingane oru threadinte aavshyam undo ippol?